Hello and welcome to Mastering-Slot-Machines.com. I'm Ted Knuden, a recreational gambler and odds enthusiast. Over the past 20 years or so I've refined my love of casino games a little, and developed personal strategies for approaching each of the games I play. This site, along with its partners, is my offering to the rest of the world. Slot machines are North American casinos' most prominent game. You can't ignore the lights, the laughter, the sounds of coins hitting metal and bells ringing - in fact, it's pretty much designed to be impossible to ignore. Slot machines are a unique beast because they make the most money for the casinos by far, but they also make the most money for gamblers overall. This two-sided confusion simply has to do with the dominance of the game. Since there are so many slot machines in operation compared to table games, all of the numbers end up being higher. After a while of operating my own websites I've come to realize there are a few different reasons visitors seek out sites about slot machines. The most common reason is people looking for an effortless good time, in the form of a free online slot machine. Another reason is people are looking to learn anything they can to help them walk away from the machines a little more 'up'. And finally, people are looking for some solid advice on the best places to play the machines, both at online casinos and land-based. My site is dedicated to these pursuits, and I am always available to answer any specific questions you might have. We feature one of the finest free slot machines on the net, with built in chat so you can keep up to date with your friends while you play. Your credits are as real as they get for a free online game, with your balance carrying over from game to game. My tips section is succinct and to the point; there are only a few things you can do to help your slots game and I want to make sure you're aware of each of them. I also have some compiled research on Vegas casinos and various online casinos concerning payback percentages, so you can know where the best return on your money is. Although I'm fond of slots, I also enjoy other casino games and like to write about them. I run sites similar to this one for the major classic casinos games (I stick with what I love). 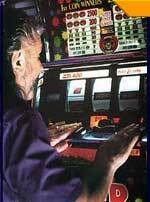 So if you ever want to delve outside of the world of slot machines, you should check out my other mastering series sites by following the links at the bottom of this page.